The results are in for my recent survey of readers and social media followers for the best climbing movies of all time. I left the poll open for a number of weeks and got an awesome response rate. I’ve gone through and tallied the results, calculating both the average rating per film and the total points per film (I asked people to rate only films they have seen, therefore some received many reviews and others very few). In terms of actually ranking the films I took the average overall rating as the first priority and then considered the total number of points and reviews–so a film with an average of 7.8 over 10 reviews would rate higher than an 8 with only 2 reviews). Sometimes the order of the ratings was very straightforward but other times (as with some of the climbing documentaries) it wasn’t exactly clear, so in those cases I used my own judgment to place one higher than the other if they were roughly tied. I also broke them up into the Best Hollywood Climbing Movies (meaning fictional or or based on true stories) and the Best Real Climbing Documentaries (you know, real rock climbing or real mountain climbing). Without further ado here are the Best Climbing Movies of All Time as determined by you, the readers. Cliffhanger was always a favorite as a kid, I don’t know why. It certainly remains a guilty pleasure to this day. It features Sylvester Stallone running through the Rockies and battling evil doer John Lithgow. It is your typical 90s action movie with explosions and machine guns and even Sly using his ice axe to slash someone’s leg open! It was a close battle with Sly for the number 4/5 position, but Clint Eastwood eeked it out. Eastwood plays a retired assassin in a James Bond-esque thriller that features Eastwood performing his own climbing stunts. It’s got footage from the desert towers of Southwest Utah to the Swiss Alps. Fun Stuff. One of the few I haven’t actually seen… I’ve heard good things about it though, and apparently the voters agree. K2 features Michael Biehn and Matt Craven starring as two Seattle climbers who jump at the chance to join an expedition to the legendary K2, the world’s second highest peak. Nordwand is an absolutely spectacular movie out of Germany. Based on the true story of Toni Kurz and Andi Hinterstoisser as they attempt to scale the unclimbed North Face of the Eiger, “the last problem of the Alps”. It’s a really well done movie with great acting, historical narrative, climbing footage, and drama. I think whether you’re a climber or not, you’ll get sucked into this gripping film. Touching the Void, certainly one of the best known tales of survival in the mountaineering world, and based on the book and true survival story of Joe Simpson who broke his leg near the top of Siula Grande in the Peruvian Andes. The story is harrowing, gripping, and at times exhausting as you watch him try to overcome what would seem to be an impossible situation. It was pretty close between Nordwand and Touching the Void, but in my mind Touching the Void certainly comes out on top–I agree with the votes here. Vertical Limit (2002) definitely gets a bad wrap from the climbing world. It features tons of unrealistic scenarios, a corny story, cheesy acting and much more. Still, I think it can be a fun sort of diversionary entertainment as you see Chris O’Donnell running (!!) at altitude on K2, jumping over a massive crevasse and sticking the landing with two ice tools in the side of a cliff. Hah. It is certainly more entertaining than any bouldering movie I’ve ever seen. Into Thin Air (1997) is such a shame. It is certainly an amazing read, but the movie is just so absolutely terrible. 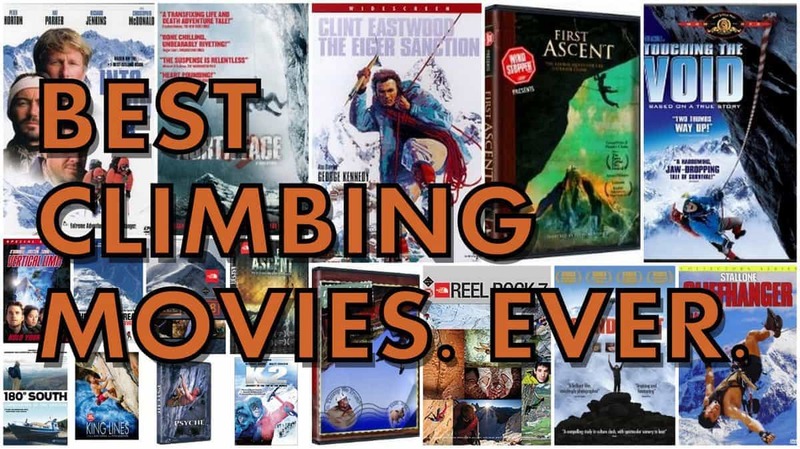 Into Thin Air beat out Vertical Limit ever so slightly to claim the title of the Worst Climbing Movie among our survey. It is one of those terrible made for TV movies which could do with a proper remake as it’s a great story. Just read the book instead. Before we dive into the Top 10 Best Climbing Movies, I thought I would give a shout out to two honorable mention favorites of mine that didn’t rank very well, nor were they reviewed by (m)any people. First, I really enjoyed Am Limit (To The Limit), which tells the story of the Huber Brothers and their attempts to establish the speed record on El Cap, a fantastic look at what goes on during these speed attempts. Second, Vertical Frontier, which is a really well made documentary narrated by Tom Brokaw about the history of climbing in Yosemite. Unfortunately, one that I haven’t had the chance to watch yet! But Sender Films is probably the best of the best when it comes to real climbing flicks. Reel Rock is an annual compilation of a number of short climbing flicks which I usually see every year. The 2013 edition looks pretty cool, with Daniel Woods bouldering in Japan, Hazel Findlay climbing some super sketchy trad routes, and (one I really wanted to see) the story of the scuffle that broke out on Everest between Ueli Steck, Simone Moro and a group of Sherpas. First Ascent (the movie — not the series) is a great flick highlighting a few climbers pursuing the elusive and coveted First Ascent. It tells a variety of stories, some of which are forgettable or a waste of time, but the story of Didier Berthod and his pursuit of the FA of Cobra Crack in Squamish is worth it alone. Definitely worth a watch. Psyche was one of those flicks that had few votes in the survey but they were all positive. I agree, it’s a great climbing film out of the UK. I particularly enjoyed Andy Kirkpatrick and Ian Parnell’s attempt at making the first winter ascent of Torre Egger in Patagonia, which is hilarious at times. Other great hard climbing from Steve McClure and Dave Birkett is featured. Learn about Chris Sharma, his life and his perspective, through a film that follows him over the course of a year and a half of climbing around the world in some spectacular locales. Undoubtedly one of the best climbers ever, and an inspiring look at his approach to climbing, including his pursuit of an amazing overhanging deep-water solo route. Something slightly different, as 180 South is not a strictly climbing movie per se, though it certainly plays a central role in this documentary. Inspired by Yvon Chouinard (of Patagonia) and Doug Tomkins (of the North Face) who set out in the 60s on a drive to Patagonia, Jeff Johnson attempts to live out an adventure inspired by theirs. There is some surfing and cheesy love story stuff, but ultimately culminates in an attempt on Cerro Corcovado with Chouinard and Tomkins themselves. I personally enjoyed the movie a lot and find it inspiring. Perhaps voted so highly as a sort of nostalgia choice… I don’t think it’s a particularly exceptional flick but it is a good look at the earlier days of climbing movies where b-production with corny and zany seemed to rule the day (perhaps taking influence from the skating genre). There is a 10-year old crusher, free soloing, base jumping, Indian Creek cracks, and even a climbing dog! All with your wacky host Timmy O’Neill. Another slightly different documentary that follows the story of six blind Tibetan teenagers and their attempt to climb the 23,000ft Lhakpi Ri near Mount Everest along with Erik Weihenmayer, a famous (and blind) climber that has scaled Everest. This was another choice that had limited votes in the survey but all were high. This movie might not be too high in the “psyche-factor” but it is a moving story and one that provides a different look at Tibetan culture and stereotypes. Tibet is often held in such high regard in the West, however these blind children are often scorned as their blindness is believed to be caused by demonic possession or punishment for past deeds. A worthwhile watch in my opinion. A well-done and extremely interesting movie that features legendary climber Conrad Anker and his partner attempting to recreate aspects of Mallory and Irvine’s fateful attempt on Mount Everest in 1924. They utilize similar clothing, equipment, and the same route, and try to answer the question of whether the duo might have been able to surmount the Hillary Step at the time and have been the first to stand on the summit (though ultimately perishing). A fascinating look into the history of climbing of the most famous mountain on Earth. It was a close battle for the #1 spot and First Ascent: The Series was barely edged out. I whole-heartedly agree that this is one of the best climbings movies ever made with exceptional production and some of the most memorable stories you’ll watch. It is actually made up of 6 half-hour shorts that are each compelling in their own right, from simply awe inspiring to downright sad. You’ve got Sean Leary (who died in a BASE jumping accident) delivering on a promise to spread his deceased wife’s ashes over Patagonia. There’s Chris Sharma crushing as always. You’ve got Timmy O’Neill and his paralyzed brother scaling a massive Alaskan peak. Dean Potter (who also died in a BASE jumping accident) free soloing peaks with his BASE jumping parachute backup, including the longest-ever wingsuit jump from the Eiger. Alex Honnold with his always palm-sweat inducing free solo antics on Half Dome (which was obviously just a taste of things to come for him). And the tragedy of Jonny Copp, Micah Dash, and Wade Johnson as they document their expedition (and final days) in an attempt on Mount Edgar in China before their untimely deaths. If you haven’t seen First Ascent: The Series, you’ve got to. I’ve even had non-climbing friends mention to me how amazing it was. I’m glad the survey reflects how awesome Reel Rock 7 is. It is just that good. Four separate films that are each in their own right extremely compelling, inspiring, and jaw dropping, and are simply four of the best stories to come out of the climbing world in recent years. Sharma again makes an appearance in our best of list, this time facing off against Adam Ondra in La Dura Dura as they try to establish the new hardest route in the world in Spain. It’s a fun and funny look at the two best in the game, one at the beginning of his reign and the other approaching the end. The Wide Boyz flick about off-width climbing was one I didn’t think would be that great, but was completely wrong. It’s an awesome story of two British climbers looking to complete the hardest off-width climb in the world (and never before done), despite the fact that there are basically no off-widths in the UK and they’ve never really done it before. The Shark’s Fin tells the story of Conrad Anker, Jimmy Chin, and Renan Ozturk in their quest to complete an iconic route and first ascent on Meru in the Himalaya. It is a story decades in the making and also includes the story of their failed attempt three years earlier and Renan’s amazing recovery after being nearly killed in an avalanche. This is a climb of such complexity that it is hard for me to imagine, and yet they were able to capture all this stunning footage and document it for us to see. Must watch. And finally you’ve got Alex Honnold once again in Honnold 3.0, where we takes on Yosemite’s three biggest walls–Mt. Watkins, El Cap, and Half Dome–in a single day of soloing, primarily free soloing without the use of gear or ropes. It is another absolutely stunning achievement on a whole other level. They did a great job documenting this epic climb as well as telling the story of Alex’s evolution from regular ol’ climbing hero to mainstream celebrity. If your palms aren’t sweating watching this, check your pulse. So there you have it! 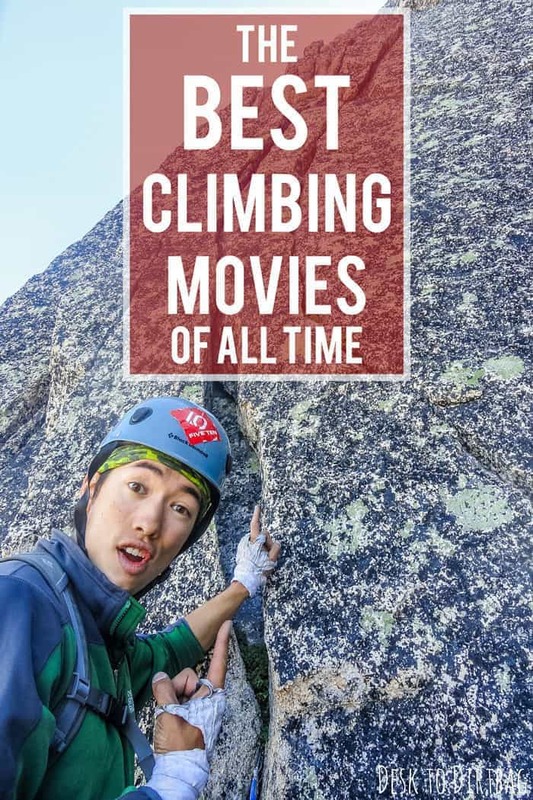 The Best Climbing Movies of All Time as determined by you! I definitely am in agreement with the top spots for each category, and while I was surprised with a few results and might quibble with the order of some in the middle, I think that on the whole this is a really accurate and spot-on list that showcases the best of the best that climbing media has to offer (from all disciplines, including sport, alpine, trad, etc). Thanks so much to everyone who took the time to fill out the survey! What do you think? Any results that you would dispute? Can’t believe that such-and-such film didn’t make the list or one that DID make the list? Sound off in the comments below. What about the Everest IMAX documentary from 1998, narrated by Liam Neeson? Definitely a better portrayal of the 1996 Everest disaster than the Into Thin Air made-for-tv movie, and probably my favorite climbing movie. I like the inclusion of K2: The Ultimate High. I took a date to that film when it was in the theater when I was in high school. Some of the dialogue is a little cheesy, and not Michael Biehn’s best role (which would either be the psychotic Navy SEAL Coffey in The Abyss of the psychotic gunslinger Johnny Ringo in Tombstone), but still an entertaining flick. And the colorful gear and outdoor clothing take me back to being a young whippersnapper hiker/climber in my late teens-early 20s in the 90s. Hey Ryan! Netflix recently recommended the French film “The Climb” (“L’Ascension” in French) and I really enjoyed it. It’s about a poor French guy with no experience who boasts that he’d climb Everest to win a girl’s heart and then actually goes through with it. It’s loosely based on a true story. See https://www.irishtimes.com/culture/film/the-climb-review-a-big-hearted-crowd-pleaser-in-the-name-of-love-1.3333535 for more details and the trailer. Ah yeah! We watched that recently as well. Pretty entertaining flick… But I was surprised at how very, very loosely it was based on a true story, quite funny how much they changed. I still get sweaty palms from watching Cliffhanger. I’m no climber though, and very afraid of heights. Haha, it does have some pretty intense scenes! Because they were climbing under the Nazi party. Like when climbers plant the American flag on remote summits like Everest or K2. Valley Uprising should be number 1! Valley Uprising is a great history of climbing in the Yosemite Valley. It’s on Netflix, highly recommended. Just watched Meru…which led me to this site. It is incredible on the following levels. The climb, first and foremost, the trust each climber has for each other, the grit of each climber to overcome monumental physical and emotional setbacks in their personal lives as well as the physical and mental hardships of their summit of Sharks fun (2x). It was so good I’d watch the outtakes…just to get more. We’ll done! It is a truly incredible climb that those guys were able to pull off… I gotta watch the full length film here soon! The short during Reel Rocks was incredible though, one of my favorites ever. I also just watched Meru…which led me to this site. I’m sure once Ryan watches it, he’ll definitely include it in the list. Rest of the movies on the list are so apt! Alright alright, I gotta watch it… Maybe this weekend! I recently read Touching the Void, and then watched the movie. Both were great! That hardly ever happens (especially with regard to the movie). However, in my opinion, Meru is hands-down the Best Climbing Movie! You must watch it, Ryan. Jimmy Chin did an amazing job in making a real-life documentary feel as professional and emotionally stirring as a full-on Hollywood production. Ryan, you’re going to have to update this old post to include Meru, because it blows away all of these! I hope you’ve had a chance to see it. Happy travels! Ohhhh yeah… I still haven’t seen the full length movie yet, but it is on my must watch list. Soon!